What can be known about the Catholic faith is as immense as the sky and as deep as the ocean. We can always learn more, although some mysteries we will never fully comprehend any more than Fido will ever understand an algebraic equation. 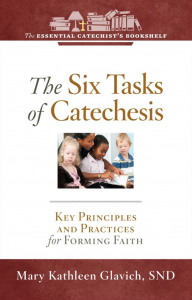 Knowledge plays an integral role in each of the other tasks of catechesis. It is fundamental to catechesis because the first step in forming any relationship is knowledge. We don’t love someone unless we first know him or her. If our goal is to bring children into a communion with Christ, it follows that we need to introduce them to Jesus and his teachings. The source of all that Catholics believe, which is God’s revelation, is the Deposit of Faith. It encompasses Scripture (both Old and New Testaments) and Tradition — the living transmission of truths from the teaching of the apostles and their successors. Our chief doctrines are expressed in our Creeds and formulated by the magisterium of the church. You are responsible for teaching the slice of knowledge allotted to you in your curriculum. In 1996, the National Conference of Catholic Bishops initiated a process for evaluating religion series. A committee … reviewed the content [to insure it was] free from error, and in harmony with the Catechism of the Catholic Church. … [Since then books labeled as being in conformity with the Catechism, are then ] approved for use. … Using an approved religion series guarantees that you are teaching the faith as the Church teaches it. 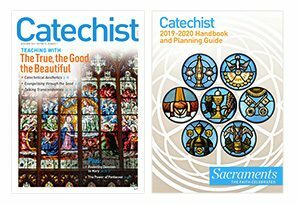 The Catechism is a valuable reference for catechists. When you would like more information about a topic or when stumped by a question concerning the faith, this book will come to your rescue. If you do not have access to a hard copy, download the text from USCCB.org. As a representative of the church in your ministry as a catechist, you must take care to present its authentic teachings and not personal interpretations. The truths of our faith are myriad and varied …. there is a hierarchy to them. Some, like the existence of God and the incarnation, are crucial. Common sense dictates that most class time be devoted to key doctrines. Sometimes the … limited number of catechetical sessions makes it impossible to cover every lesson. … And sometimes class time allows for teaching only a portion of a lesson. 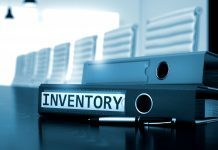 In those cases, the material’s significance should determine your decisions of what to teach. Impress on your children that there is always more to learn about the faith. … Moreover, something new can always be discovered in the Bible. … As we read and ponder Scripture, the Holy Spirit gives us fresh insights. Plus, there are two thousand years of Church history to explore and hundreds of saints to meet. Inform your students about Catholic websites such as Vatican.va, Catholic.org, and Zenit.org, which deliver daily e-mails containing the pope’s homilies and other news about the Church. Encourage them to attend lectures about the faith, take courses, join Bible studies, and read Catholic books, magazines, and newspapers. “Your words were found, and I ate them, and your words became to me a joy and the delight of my heart” (Jeremiah 15:16). It is imperative that children understand that the Bible is God’s word, divine revelation, inspired by the Holy Spirit, and interpreted by the Church. Communicate the Bible’s sacredness by holding and reading from it with reverence, and by enthroning the Bible on a shelf or table. God intends us to take his words in the Bible personally. Present sacred Scripture as a love letter in which God tells us repeatedly that he loves us. If possible, provide a Bible for each child. In parent newsletters or at meetings, encourage reading the Bible together as a family. Suggest that the children keep their Bibles on their pillows and read a few verses every night. Children should become familiar with the biblical books, their origin, content, purposes, and writing styles. Moreover, they ought to know how to locate verses and use the Bible for prayer. Compare a Scripture citation to a house address: the city (book), street (chapter), and house number (verse). Practice looking up passages. Have the students write citations for verses, exchange papers, and locate their classmate’s verses. Or draw up a list of questions and Bible citations where the answers are found. See who will answer them all first. Compare the types of biblical books to the forms of writing in a newspaper or the kinds of books in a library. Assign projects based on biblical stories: posters, dioramas, poems, interviews, and plays. To give more insight into biblical stories, have the students rewrite them from the point of view of a character — for example, Goliath’s version of the fight with David. Have students act out stories in the Bible by using a script, miming the event, or forming a tableau. Incorporate art masterpieces, songs, and movies related to Scripture in your lessons. Include a Scripture reading in every prayer service. 1. Write a verse on the board. Erase one word or phrase at a time and have the children recite the verse each time. When all the words are erased, the class will be saying the verse by heart. 2. Write verses on strips of paper and cut them in half. Distribute them and direct the students to find the half that matches theirs and then memorize the verse. The Apostles’ Creed … can be prayed at the Eucharist in place of the Nicene Creed and is the opening prayer of the Rosary. Older students ought to know the Apostles’ Creed by heart and the meaning of its words. To teach the prayer, create a worksheet with lines of the prayer on strips. Have the children cut the strips apart and arrange them in order. Or create a crossword puzzle with clues related to words in the prayer. Pray the Creed at the beginning or end of lessons. Make the doctrines of the church palatable for your children. Explain them in terms their minds can grasp. In the manner of Jesus, who taught about providence by referring to birds and flowers, and of St. Patrick, who compared the Trinity to a three-leaf clover, employ concrete objects in your presentations. Tell stories to illustrate a point, or use analogies. Since students have different learning styles, present the truths in multiple ways. 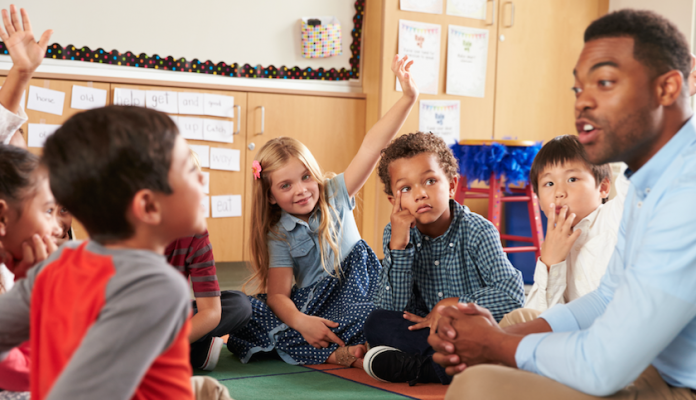 For instance, to teach about the communion of saints, speak about it for the aural learners, show pictures and diagrams for the visual learners, have material about it read individually for the verbal and solitary learners, and discuss it in groups for the social learners. For the physical learners, teach a finger play or a song about the communion of saints, or have the children construct a model of it. Reading. Teaching religion by reading the textbook and the Bible is as common and comfortable as blue jeans. However … bedazzle the blue jeans! Have a student read a few sentences and call on someone to continue. The next student does the same. Assign any speaking parts to different students. Keep the children’s attention by instructing them to underline, circle, number, or star key words and concepts. These markings will help them review. Discussions. Two side benefits of discussions are that through them students share their faith, and community is created. Incorporate different types of discussions: whole class, small group, fishbowl, panel, question box, and problem solving. Students as teachers. An effective way to learn something is to teach it. Provide opportunities for your students to be teachers. Older children could talk to first communicants about the Eucharist. Your class might present a gospel story to another class. Or within your class, a student or a group might give an oral report on a topic. Teach in ways that are fun. Play games, show videos, and invite guest speakers. Work together with partners or in groups. Avoid making the great truths of our faith boring. One child once thought that manna was “unleaded” bread. Teaching the faith introduces children to words that are unique to religion and new to them. In addition, some familiar words, like grace and brother, mean something different in religion. The students could keep a notebook and enter new words and their definitions. 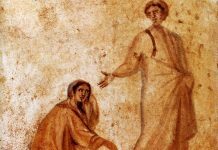 Imparting the faith today involves a great deal more than [memorization alone]… Quoting St. John Paul II, the General Directory for Catechesis states, “The blossoms … of faith and piety do not grow in the desert places of a memoryless catechesis” (no. 154). Your children might enjoy the challenge of memorizing the books of the Bible and the names of the twelve apostles. Mnemonic devices [and teaching acronyms] can be helpful. It’s said that adults must hear something seven times before they remember it. Imagine, then, how often we must repeat things to children! One way is to ask children at the end of a lesson to state one thing they learned. You might also have each student prepare a quiz on a topic and exchange it with a classmate. Or, play games. For added excitement, award a prize to the winner or winning team. Around the World (Conductor) One child stands beside another child’s desk. Ask a question. The first one to slap the desk answers the question (or the first to answer). If correct, that child moves to the next desk. If incorrect, the other child can answer. If he or she is correct, the two children switch places. If both answer correctly simultaneously, ask another question. If neither child can answer, the first person moves to the next child, and either you or another child provides the correct answer. Jeopardy Make a grid of five categories with five answers per category. Assign points for each answer, depending on its difficulty, and write them on sheets of paper. Cover the answers with the corresponding numbered papers. Form three teams and hand each one a bell. The teams choose a category and a number of points and supply the question for the uncovered answer until they are wrong or stumped. For final Jeopardy, the teams bid their points and then write the question to the final answer. The winning team is the one with most points. Where I was DRE, two teachers created the game using PowerPoint and played a recording of the Jeopardy theme song. Baseball Prepare four sets of questions. Code each set as a single, double, triple, or homerun according to difficulty. Draw a diamond on the board. Form two teams and let the players choose a category of question when it is their turn. An incorrect answer is an out. Three outs retires the side. Appoint a scorekeeper to keep track of each team’s runs. If your lessons are centered around the person of Christ, they will have a more lasting effect. It’s comparatively easy to give up a set of beliefs; it’s much more difficult to give up a person. … [Y]our students should come to know Jesus as a friend. He, better than anyone else, fits the definition of a friend: someone who knows all about you and likes you anyway. Present Jesus to your children as someone who can and will help them, who cares when it seems as if no one else does, and who has loved them to death. Once they are attracted to Jesus, they will thirst for more knowledge. Lastly, be a witness to your students. Relating personal stories enhances your teaching and makes a memorable impact. Sr. Mary Kathleen Glavich, SND, a noted educator and speaker, is author of more than 80 books including The Six Tasks of Catechesis, The Catholic Way to Pray, Enriching Faith: Mary, Praying on Empty, and Leading Young Catholics into Scripture, all from Twenty-Third Publications.